There is a major construction and renovation project coming up. It goes under the name of a New Heaven and New Earth. Who knows, It's possible that this cosmic remodeling may expand heaven to encompass the entire universe of creation. In the new universe, New Jerusalem will be the focus of almost everything. Other names for this city are "the Jerusalem above" (Gal. 4:26), "the city of living God, the heavenly Jerusalem" (Heb 12:22), "the holy city" that "comes down out of heaven from God"(Rev, 21:10). Some believe that the New Jerusalem will constitute a celestial temple that is both physical (Rev. 21:12-21) and spiritual (Rev. 21:22). Isaiah 65:17-19 For behold, I create new heavens and a new earth; And the former things shall not be remembered or come to mind. But be glad and rejoice forever in what I create; For behold, I create Jerusalem for rejoicing, And her people for gladness. I will also rejoice in Jerusalem, and be glad in My people; And there will no longer be heard in her The voice of weeping and the sound of crying. 2nd Peter 3:13 But according to His promise we are looking for new heavens and a new earth, in which righteousness dwells. 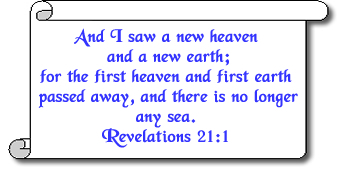 Revelation 21:1 And I saw a new heaven and a new earth; for the first heaven and the first earth passed away, and there is no longer any sea. Who knows, It's possible that this cosmic remodeling may expand heaven to encompass the entire universe of creation. The New Heaven and Earth is so great that memories of the Old Earth will fade away and be forgotten. The New Heaven and New Earth will last forever. Is there water in the New Heaven? The only water mentioned flows directly from the throne of God. Revelation 22:1 And he showed me a river of the water of life, clear as crystal, coming from the throne of God and of the Lamb, in the middle of its street. And on either side of the river was the tree of life, bearing twelve kinds of fruit, yielding its fruit every month; and the leaves of the tree were for the healing of the nations. In the New Heaven there will be no more tears, sorrow or crying. There will be no sickness, no hunger, no trouble and no tragedy. Just absolute joy and eternal blessing.